Cells from acute myelogenous leukemias (AMLs) are characterized by a block in normal differentiation resulting in dramatically expanded pools of neoplastic precursor cells, both intramedullary and often extramedullary. Other features that also reflect the neoplastic behavior of these cells in vivo include their clonality, the presence of recurrent karyotypic abnormalities, their transplantability, and their often abnormal patterns of expression of and response to cytokines . We are only now beginning to understand some of the mechanisms underlying the observed block in maturation and perpetuation of proliferation of immature myeloid cells in AML. In recent years, molecular biology has provided tools for dissecting the different maturational stages and differentiation pathways of normal myelopoiesis . Also, the study of oncogene activation in primary AMLs and AML cell lines has yielded models of tumorigenesis in this cell system . 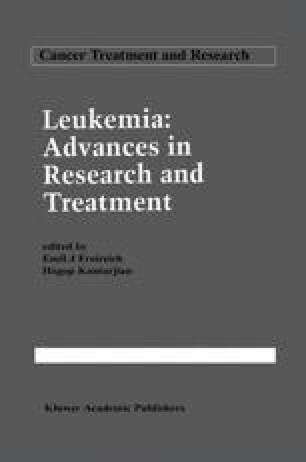 Similarly, work by a number of laboratories has focused on the possible role of cytokine expression in the pathogenesis of myeloid leukemias. Often, myeloid cell lines established from patients with acute leukemias have served as sources for nucleic acids when isolating myeloid-specific complementary DNAs, and as well-characterized cell populations for in vitro studies. These cultured cell lines in many but not all aspects resemble their primary, uncultured counterparts.